Public devotions to St. Philomena were first introduced at St. Josaphat Church (now part of Mother of Divine Mercy Parish) in August of 2005 during the 200th Anniversary of the Translation (or Transfer) of the relics of the saint from Rome to Mugnano in Italy. An image of St. Philomena was placed at St. Josaphat in 2011. This page will help introduce you to this powerful wonderworker and also provide you with some devotions which you can incorporate into your own spiritual life. PLEASE CHECK THE LATEST MOTHER OF DIVINE MERCY BULLETIN. The following text was provided by Joseph G. Atkins, CFE, an active member of the Universal Archconfraternity of St. Philomena. Parts of the text have been omitted. An excavation in the Catacombs of Priscilla at Rome in 1802 yielded a preserved tomb of a young girl with the inscription on her three tombstones-PAX -TECUM-FILUMENA which means “Peace is with you, Philomena. The tombstones were arranged differently due to construction which became a part of a controversy that has now been resolved. Along with the inscription there were symbols, the anchor, arrows, palm leaf and lily. The anchor and arrows represent tortures that were tried on her; the palm leaf is for martyrdom and lily is for virginity. This tomb held the remains of one of the youngest saints in the church’s history. Her name is Philomena who was martyred and became a saint age the age of 13. Very little is known about Saint Philomena’s life. Twice in 1833 Saint Philomena appeared to Sister Maria Luisa of Jesus, an impassioned devotee of this saint, and told the nun her life story. Her story was not very comprehensive except for the last forty days of her life. The final days describe her imprisonment, various tortures and death under the direction of the Roman emperor, Diocletian. Blessed Damien de Veuster- Catholic priest who worked in leper colony in Honolulu, Hawaii; He had great devotion to her and built a church in her honor, St. Philomena parish. He was canonized on October 11, 2009. Saint Frances Cabrini- Missionary and “Patron of Immigrants”; she promoted St. Philomena throughout America. Leo XII declared her The Great Thaumaturgist (miracle worker) of the 18 Th century. He had two Concessions of Mass to her. Gregory XVI named her Patroness of the Living Rosary. A mass and proper Office in her honor was approved by him. This exceptional privilege has been granted to very few saints. Pious IX was miraculously cured by her; he made a pilgrimage to her Sanctuary in 1849. He also had Concession of a Proper and Votive Mass to Her. He also proclaimed Her the saint “Second Patroness” of the Neapolitan Kingdom. Pious VII In 1805 he donated the remains of St. Philomena to Mugnano del Cardinale. The priest at shrine, Don Francesco DeLucia had to obtain special permission to receive her remains. Benedict XV- very devoted to St. Philomena and continued efforts to spread her devotion. Pious XI great devotee to Her; He donated many gifts to Her as did his predecessors. Paul VI- his goodwill was used to promote the devotion to St. Philomena by his works. Bartolo Longo- founder of the Sanctuary of Pompeii. Jean Claude Colin- founder of the Society of Mary (Marist Priests). He was cured by using holy oil from her lamp. He erected a statue of her in his monastery. Pauline Jaricot- She was miraculously healed in 1835 at the Sanctuary. She founded the Propagation of Faith. Her phenomenal healing helped propel St. Philomena into sainthood. King Ferdinand II and wife Queen Maria Cristina (she a venerable). He a great devotee; his wife wanted to set up an orphanage next to shrine. Jean-Leon Le Prevost- founder of the Brothers of St. Vincent de Paul. He had a great devotion to her for her help to make his foundation succeed. When it did, his brothers became passionate propagators of the devotion to her. Guilia Colbert- Marquise of Barlo, very devoted to St. Philomena, visited the shrine several times. St. Philomena is known around the world; she has thousands of devotees. People have discovered that nothing is too trivial or insignificant for her. She will help any one. All she asks is for your prayers. Our relic of Saint Philomena is a second class relic of stones from the original tomb of Saint Philomena in the Catacombs of Saint Priscilla. This relic has a letter of authentication from the Abbess who looks after the catacombs. This relic was given to our community in 2006. You are invited to make a Monthly Novena from the 3rd-11th of each month. In order to join in this novena, say the prayer provided below or any prayer to St. Philomena that you know of or prefer to use. – For the conversion of sinners, the return of those separated from the Church, and the perseverance of the just. – For the intentions in the petition box before St. Philomena’s image at St. Josaphat Church. Illustrious Virgin and Martyr, St. Philomena, behold me prostrate before the throne whereon it has pleased the Most Holy Trinity to set thee. Full of confidence in thy protection, I entreat thee to intercede for me with God. Ah! from the heights of Heaven deign to cast a glance upon thy humble client. Spouse of Christ, sustain me in suffering, fortify me in temptation, protect me in the dangers surrounding me, obtain for me the graces necessary to me, and in particular….Above all, assist me at the hour of my death. Amen. Those accustomed to using the older prayers and/or offering a perpetual novena every Friday may continue to do so. Complete and utter healing, for the intention of marriage; and in the event of failing to marry, to then become a Priest, with the hoped for intention of martyrdom, without which, I may not have ‘even’ a Heavenly hope, whatever about a Heavenly Reward. Hello, I’m Fr John Rocus, Pastor of Holy Spirit Church in Brighton MI. I will be leading a pilgrimage to Mugnano Italy and the shrine of St Philomena on May 17-25 of 2012. Included is Assisi, Amalfi coast, Pompeii, and Rome. 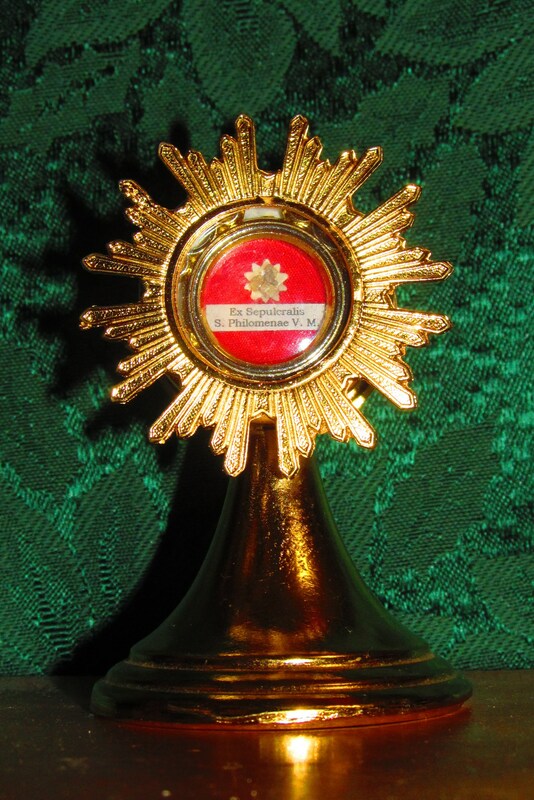 Hello, after reading on your page about St. Philomena I am moved to want to ask how it is I can get ahold of one of St Philomena’s relics. I am a youth minister at Our Lady of Mercy in Mercedes, Tx of the Diocese of Brownsville, and right now we have one of our youth in the hospital trying to recover from a horrible car accident. I try believe that she can be of much help to our community spiritually as we are all suffering from his injuries. We will ask her for her intercession but it would be amazing to have a relic to pray infront of for her intercession. Who ever reads this please keep in your prayers Isaiah Graza. He is fighting paralysis and has already gained a bit of movement in his arms. He needs more prayer. St Philomena please pray for him. Thank you for placing my son’s name, Erich H., at the base of the saint’s relics, nieces, nephews, godchild as well as my small business RF Design (and my own name, Karin S.) and their genogram, for healing, cleansing, exorcism, deliverance, blessing. All you Holy Men and Women, intercede for us!